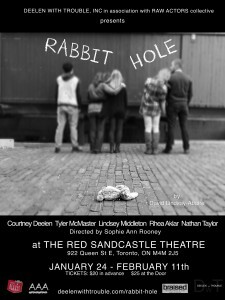 Rabbit Hole is a week from opening! I am so excited about this show! 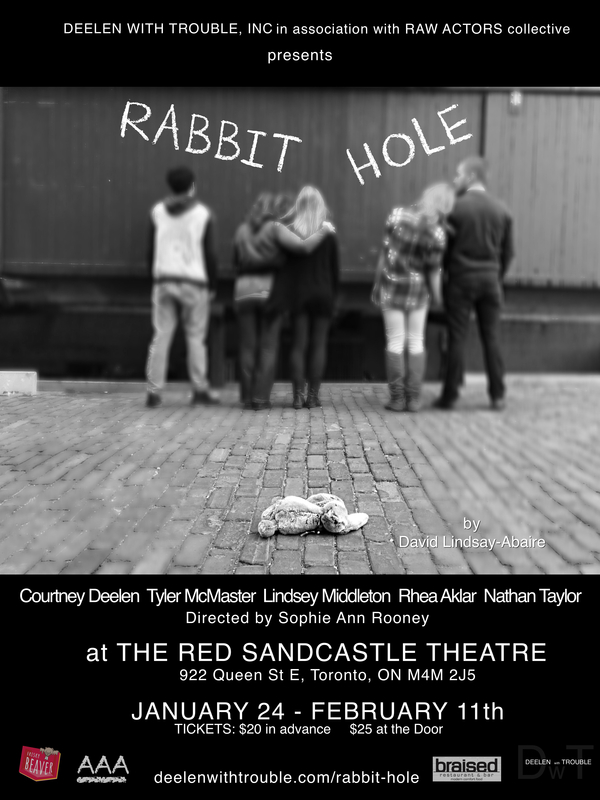 Not only because it is a beautiful piece of theatre that makes you feel every emotion possible, but because of the amazing group of artists I am working on the show wit h.
When one family loses a child the roller-coaster of emotions runs in every direction. Guilt, sadness, love, anger, acceptance, hurt, and hope rise to the top and weave through every moment. This Pulitzer Prize winning play by David Lindsay-Abaire deals with the many ways family members survive a major loss, and includes comedy as well as drama. Deelen with Trouble has partnered with Bereaved Families of Ontario and we have some amazing perks for helping out our Indiegogo campaign that help both great organizations. All the artists involved in the show are members of RAW Studios, headed by our award winning director Sophie Ann Rooney. This isn’t a regular rehearsal process as the blocking is extremely loose (which leads to much more fun and freedom) and we as actors are truly able to follow our impulses and give the most honest performance we can each night. I have been studying with Sophie for the past year and working with her has opened me up in so many ways as an actor and as a person. You can check out RAW and start transforming yourself as an artist. DEELEN with TROUBLE is a Toronto based production company founded by Courtney Deelen and Micheal T Burgess, a husband & wife filmmaking team. Our mandate has always been to create entertaining, thought provoking projects with heart. We strive to connect with our audiences through stories while also bringing awareness and giving back to charities that are near and dear to our hearts.